The safety and health of our workers and colleagues is a core value of the mining industry. CORESafety®: Committed to Excellence in Mining Safety is an initiative developed and led by the members of the National Mining Association to achieve an aggressive safety goal of eliminating fatalities and reducing mining’s injury rate by 50 percent over the next five years through implementation of safety and health management systems. Today’s mining companies recognize that continuous performance improvement necessary to achieve the goals of zero fatalities and injuries means going beyond what’s required by regulations. To accelerate the pace of mine safety improvement, we have taken voluntary steps to implement best practices that encourage a “culture of safety.” Risk assessment processes identify safety controls to eliminate or minimize the impacts of hazards. By identifying and eliminating potential hazards, and deploying state-of-the-art technology, American mining has developed an award-winning safety framework that is bringing more miners home safely after every shift. 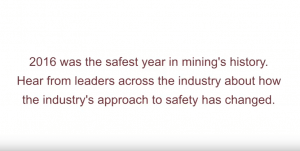 The CORESafety® system has been endorsed by the Society of Mining, Metallurgy and Exploration and received the 2015 five-star distinction award from the International Safety, Quality and Environment Management Association. Over the past 15 years, our commitment to safety has led to a 56 percent cut in the rate of injuries in U.S. mines and a 63 percent reduction in the fatal injury rate. More can and will be done.